This bit of whimsy made me smile today! I adore the wonderful horizontal sections of the background – the dark brown beach, the sapphire water, the pastel sky – another for your horizon series – but then overlaid with that amusing beach conversation between graffiti man and that pesky seagull. A great moment captured. Thanks, Brenda! 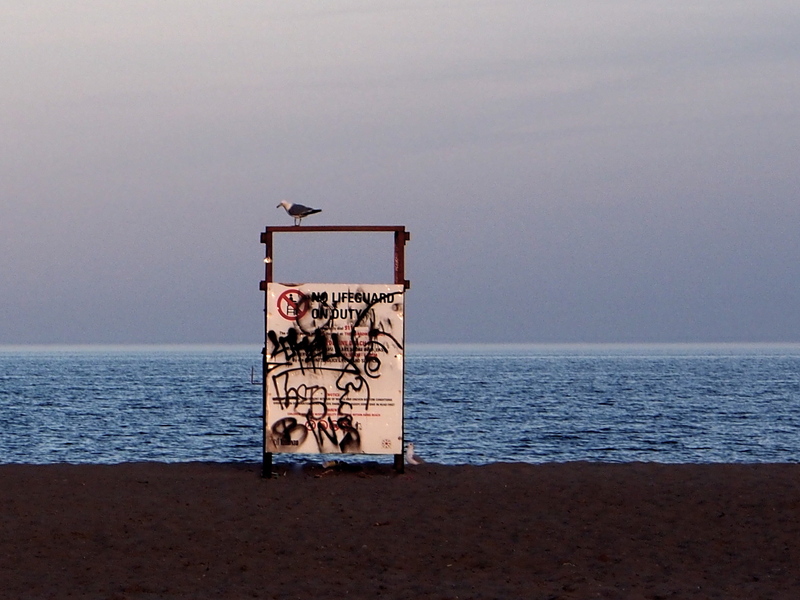 I have decided to turn my horizon series into, ‘A Year at Woodbine Beach’. I have been spending time and taking photographs there just about weekly for several months now. I see the series emerging! Soon to be shared. A work in progress, needless to say! I wouldn’t even have noticed the face if not for your narrative – all I saw was vandalism and ugliness. Thanks for making me take a closer look. Ah! I know what you mean. I saw the graffiti at first, too. But, now, every time I visit this spot on the beach, I see the face as part of the narrative. Sometimes a foreground part of it, sometimes background. It’s now become – not something to get rid of, but rather another element of the landscape, if you know what I mean. I don’t know if that’s a good or bad thing, it’s just how things are, at least, for the moment. Have a great weekend, Lee! So nicely seen and captured, Juli. Thank you for the smile, and I wish you a wonderful weekend!